Description Alt was an Austrian painter, draughtsman and printmaker, but was perhaps most productive and accomplished as a watercolor painter. His father was the artist Jakob Alt (1789-1872), and from the age of six Rudolf accompanied him on study trips and colored his father's drawings. From 1825 to 1832 he studied at the Akademie der Bildenden Künste in Vienna. On finishing his studies he traveled widely with his father, through Italy and Austro-Hungary. After 1835 he concentrated more on scenes of rural and urban life rather than landscapes. Many of these were reproduced as lithographs. 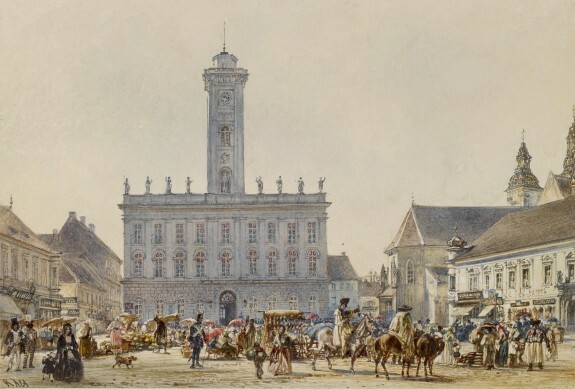 In the 1840s his brush work took on a crystalline clarity, synthesizing atmosphere with myriad details, as in this watercolor, which probably dates from this period. Throughout the rest of his life Alt was greatly in demand from royal and aristocratic patrons.